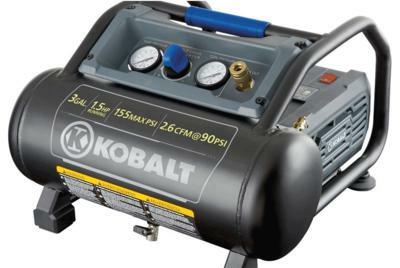 I have a KOBALT 3 gal air compressor model #0200382 (serial # 0057655) and the threads on the air regulator knob have broken away in some spots so the pressure can not be adjusted beyond 15#. I doubt the compressor has more than 30 hours use. None of the websites (mastertoolrepair; Sears or others) don’t list the model. Any ideas? Thanks for any information. BB, I suspect if you pull the cover off you will find that almost any general purpose mini-compressed air regulator will suit. Make sure you empty the tank with the power off before you disassemble the piping to remove the existing regulator. Take that one with you to the store to find a comparably sized model. But it looks like it may be unconventional. Did you try the number in the manual for parts? I also have a failed regulator knob as the plastic threads have stripped on this model. The regulator is made into the manifold. No way to replace unless the entire manifold gets replaced. I just need a new knob. Will see if I can find my parts book. Otherwise, as mentioned elsewhere, probably the best thing to do is roll your own plumbing with conventional parts. Might not look great, but it’ll work if done right. Also have a failed air pressure regulator knob. Mine probably doesn’t have 2 hours of use.. I guess you get what you pay for. Model 0300841 here…. You may have a chance. Your model is listed on parts sites, so you have a shot at finding what you need. A quick fix got me going. This was my emergency fix. gets you going. Zip ties under the manifold around the knob will engage spring. No need to unscrew any thing. I had to push the knob down and set in place with tiny screw in knob. Then Used two zip ties together sinc my zip ties were too short alone. and doubled. One on each side of the knob.